Hexagon Smart M.App is a simple to use platform any organization or freelance developer can use to build lightweight and dynamic applications targeted to solve a specific problem. It combines content, business workflows, and geoprocessing into a single application to produce powerful visualizations. The primary focus of Hexagon Smart M.App is to present users with analytical views of what was, what is, what can be, and what will be. 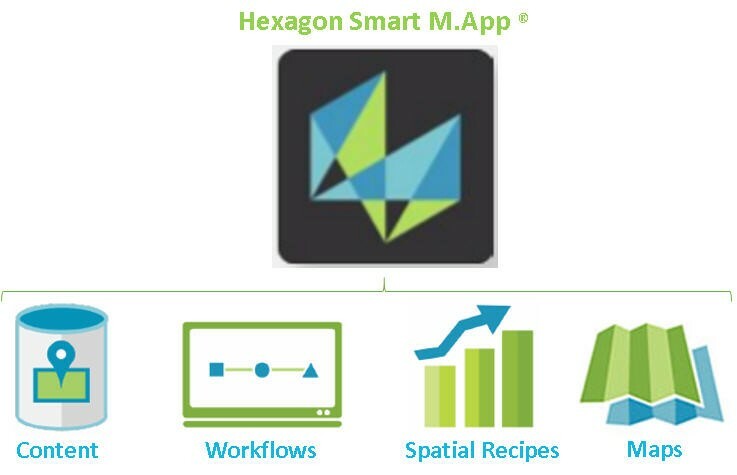 Hexagon Geospatial Smart M.App an accumulation of content, workflows, Spatial recipes (analytics) and maps; is an interactive, web-based workroom for designing, building and publishing the applications. App Content – a cloud – based web application that enables users to upload and manage content in the M. App Studio environment. It enables users to create data folders, data uploading, compressing imagery and publishing such information as web services. It is a standalone application that users can purchase in M. App Exchange and integrate to M. App Studio. App Workflows – Workflow rules definition and configuration tools enable highly focused and efficient workflows without the need for expensive custom code. App Spatial Recipes – Are spatial models built to analyze, provide data validation for quality assurance and create custom output. Provide the users with hundreds of functions, algorithms and analytical routines that can easily be chained together into models that solve specific Geospatial problems. App Map – Simple interface configured for specific business workflows reduces training overhead while increasing productivity.